Making an ‘Irish’ version of Nachos using potato is rather a clever idea, I grant you, but the execution was a bit less appealing. One of the pleasures of traditional nachos is the contrast of textures between the toppings and the crisp chips… Nearly soggy potato slices don’t quite ‘cut it’, sad to say. 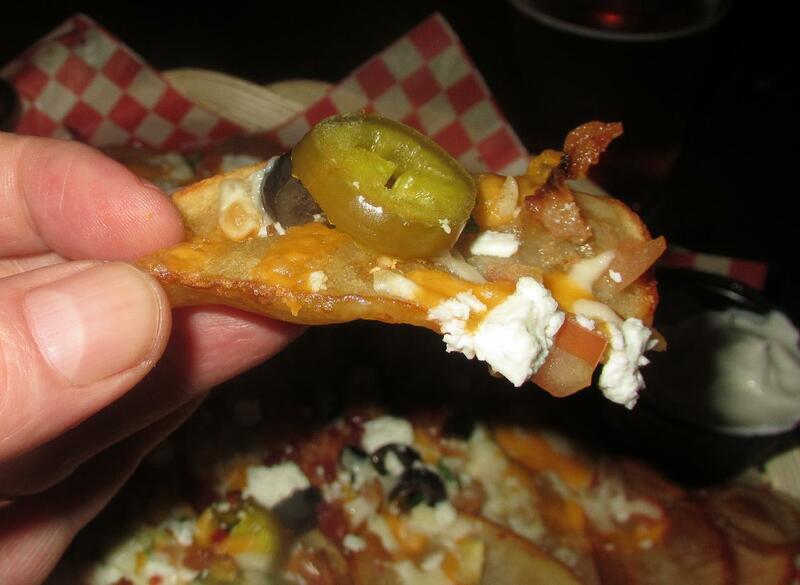 I liked the toppings, actually… Feta and Black Olive is not standard and is something I’ll try on my own Nachos sometime. As for the Irish-Mexican fusion, a little work needs to be done… Chimichangas made with Boxty, maybe? Ha … never heard that story before! I think proper potato skins (ie: mostly hollowed out skin) would have been better than these slices. They look quite appetizing in the photo. They also look crispy, but judging by your description, they were not.